Arabian Pendant with Diamond. 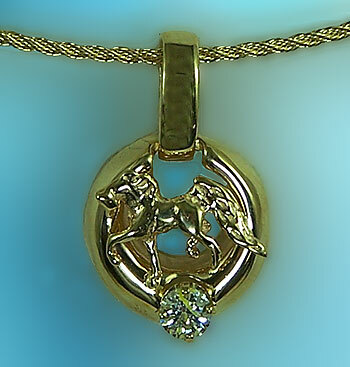 The Gorgeous Horse is your destination for custom Arabian jewelry. Here's your Arabian in action set on a solid gold frame. Pictured here in solid 14kt yellow gold with a quarter carat diamond, however, you can customize yours by switching the diamond with just about any gemstone of your choice. Just put your request in the comments box below and we can meet your needs! Dimenisons: 1/2 inch wide x 5/8 inches tall. Set with .26 carat SI2, I1 G-color round, brilliant cut diamond.